Our work with the children is inspired by the Reggio Emilia approach to Early Childhood Education. We utilize this approach to develop an “emergent curriculum.” An emergent curriculum is developed by observing each child individually as well as children’s work in groups and developing activities and classroom areas based on the explorations, interests and developmental needs of each child. We encourage children's problem solving and skill development through hands-on activities that help children explore art, science, math, literacy, social and emotional expression, creativity, messiness and fun. We nurture children's sense of wonder and hope to strengthen their self-esteem and feeling of belonging to a community. In order to create our lesson plans for the classrooms the teachers meet each day to formally discuss their observations an﻿d develop the activities for the following day based on the interests or needs of the children. Through this process of observing and planning the teachers find "Studies" that they begin to formally do with the children. A study might be a topic like Space or the Ocean or it might be a concept like Designing a Playground, but the study always comes from an inspiration of the children and is then supported through the proposals and provocations created by the teachers. Teachers set up the classroom so that children can independently explore. In addition, teachers work with children and ask them questions about their ideas to help them think more deeply about their exploration. 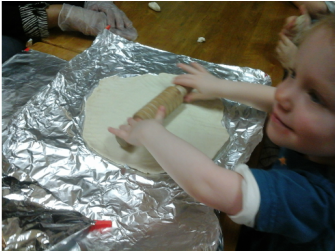 For example, if a child is mixing ingredients during a cooking activity, the teacher might ask, “What do you think will happen when you put the water into the flour?” The children talk about their ideas and then add the water. Once the water is added and they work with the ingredients the children say, “This is sticky, it is sticking to my hands.” The teacher might say, “Why do you think it is so sticky? Or do you want it to come off of your hands? What can you add that will help get it off your hands?” By working with children as they explore, we help them create “file folders” of experience so that as they approach new problems they are able to refer to past experiences. Teachers are always working to engage children in the classroom and encouraging them to discover new ways of using materials. Many parents ask us about how the day is structured. Please see Life at AMB to see how the children move through their day. The structure is in place to provide children with a consistent routine that helps them to feel secure at school. In order to foster creative exploration a very tight structure is provided so that children know what is expected of them and how they can work in the classroom. This clear understanding then gives children the freedom to work with different materials and test out their ideas within a supportive environment. We give children freedom to explore and create. We do not force children to participate in particular activities or projects. We encourage them to try new types of activities and build bridges between the activities they naturally gravitate towards and activities that are less comfortable for them. The children in our programs are given opportunities to develop their literacy skills through play with letters, numbers, books and other storytelling materials. Literacy is developed best by helping children grow an interest in expressive language skills and receptive language skills. Expressive language is speaking and writing skills and receptive language is listening and reading skills. Speaking skills: Children are given an opportunity to speak and share ideas, stories and experiences. Many times their words are also written down on pictures, experience charts or other types of signs in the classroom. By seeing their words written down, children begin to connect that the words they say have a form in writing too. Writing Skills: Several elements need to be nurtured for a child to develop writing skills. Before a child can write, their hands must be strong enough, they must have the desire to express themselves through the written word, and they must know how to manipulate writing utensils. The last step is the ability to form letters and words. We give children an opportunity to explore many materials that help strengthen their hands and prepare them for writing. These include: playdough, clay, making bread, pushing toys, stamping chalk, crayons, markers, paint brushes, finger paints, sticks etc. Starting in Fall 2014, our Kindergarteners will start the exciting "Writing Without Tears" approach. For more information on "Handwriting Without Tears," click here. Listening Skills: Believe it or not listening is a skill! Children have to learn how to relax and hear what another person is saying. We encourage listening skills though storytelling in all forms, and interesting activities in the classroom that require children to listen to one another. Reading Skills: Children develop the ability to read at different times! Research has shown that the best way to develop reading skills is through having conversations with children so that they value language and story. We help inspire children to read and to be aware of print in its many forms. From watching and working with recipes during cooking, to looking at books, to looking at signs in the neighborhood, we use all of the experiences in the classroom as an opportunity for children to be exposed to words and produce a love of them. Our goal is to help children grow and develop a love of learning, exploration and problem-solving and to feel safe and secure to experiment and appreciate people, nature and the world around them.